I'm popping in real quick to share a few things from the last 2 weeks. 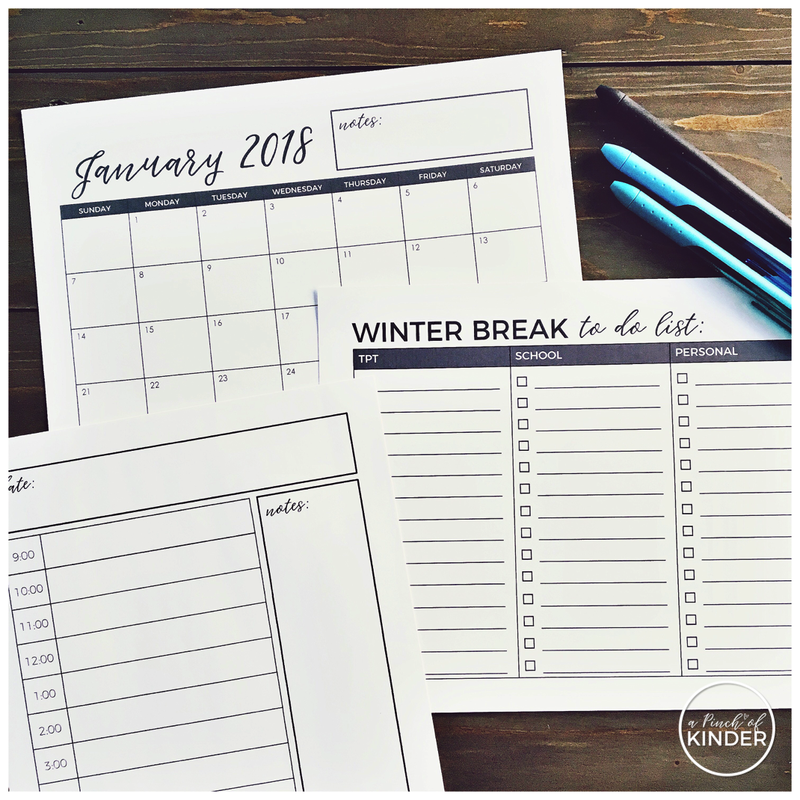 Scroll to the bottom for the calendar freebie! 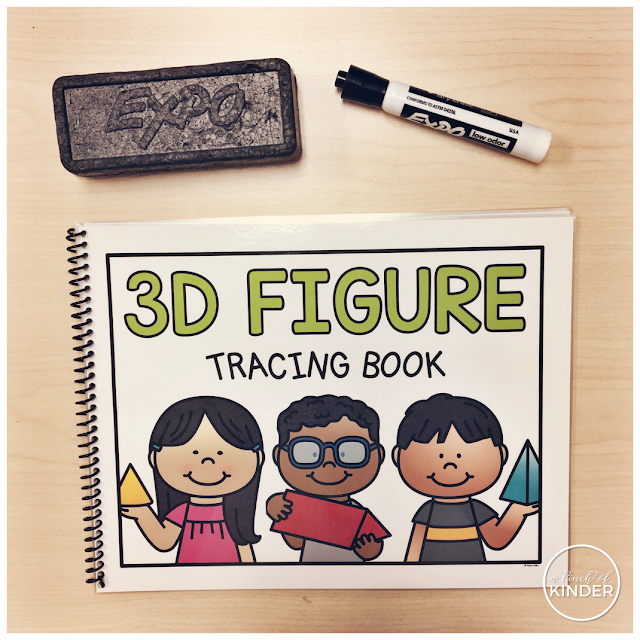 I updated this one this summer and the kids enjoyed tracing the figures and words with the expo markers! 2. 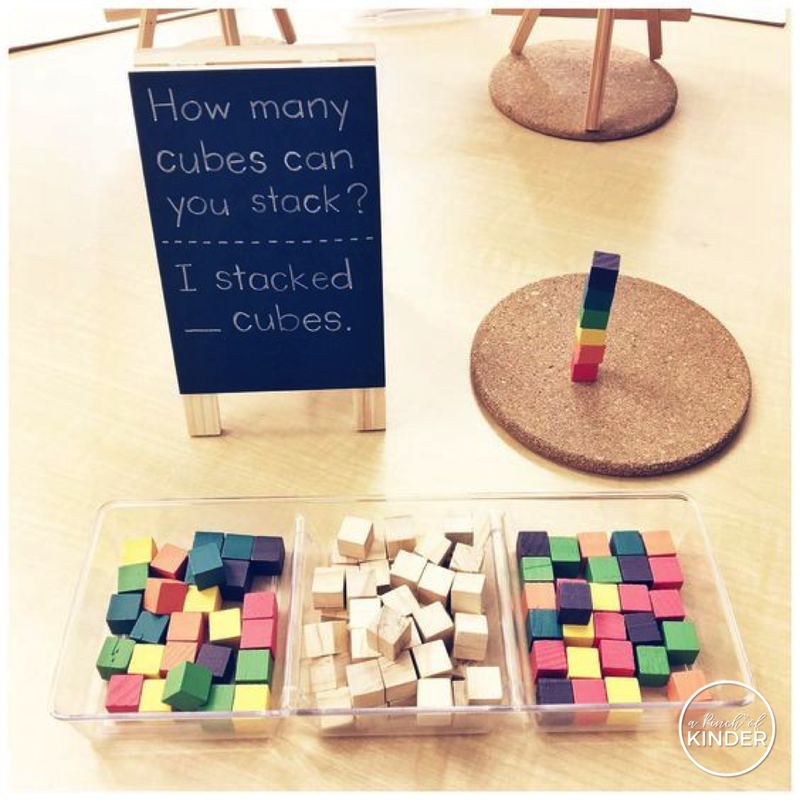 HOW MANY CUBES CAN YOU STACK? 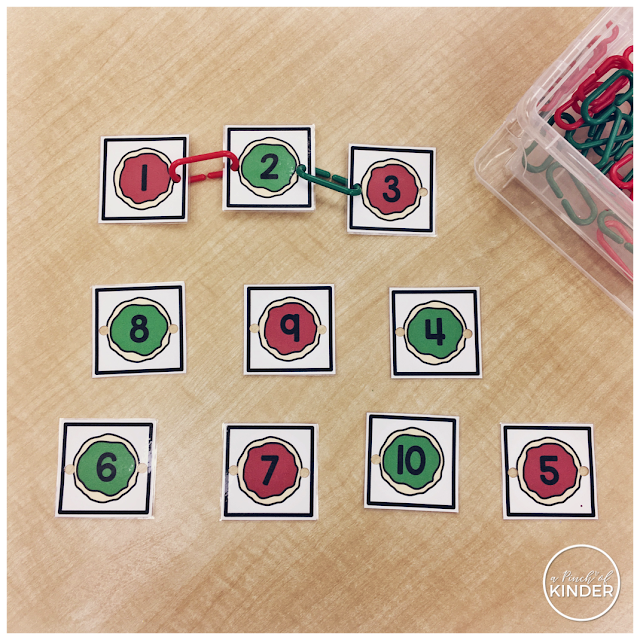 Here is a simple building/number sense centre that I set out before the break! How many cubes can you stack? Students were encouraged to record how many they were able to stack before their tower toppled over. 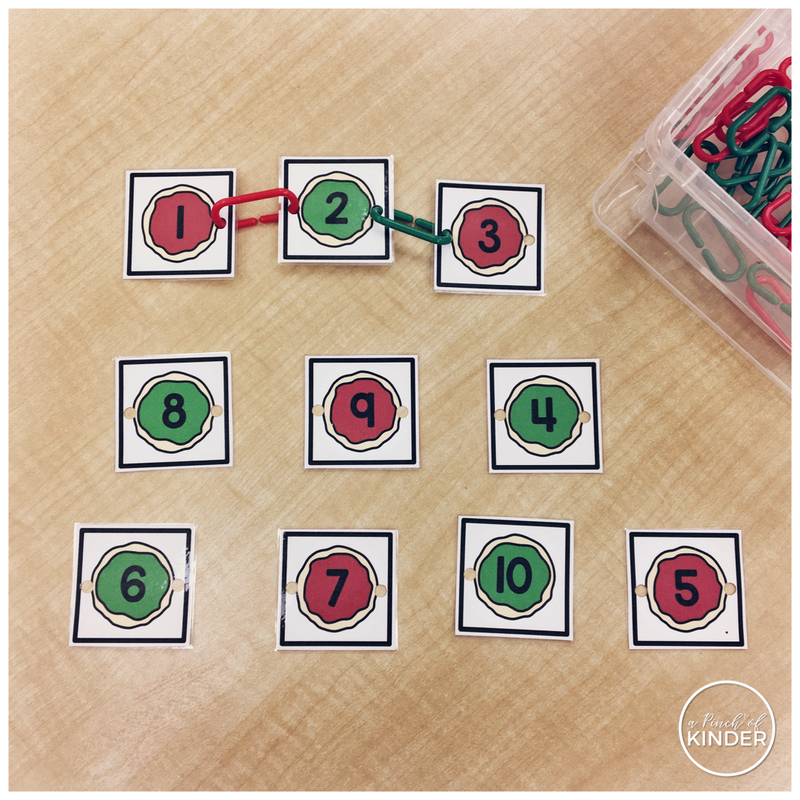 One area of need we identified in our students during our BCI was ordering numbers to 10, so I quickly whipped up this Christmas lights number order centre. I tied a piece of string on to 2 chairs and and set the Christmas light numbers out with clothes pins. Students were encouraged to clip the lights in order. We spilled the beans on our pregnancy this week and I can't thank you guys enough for the well wishes we have received. 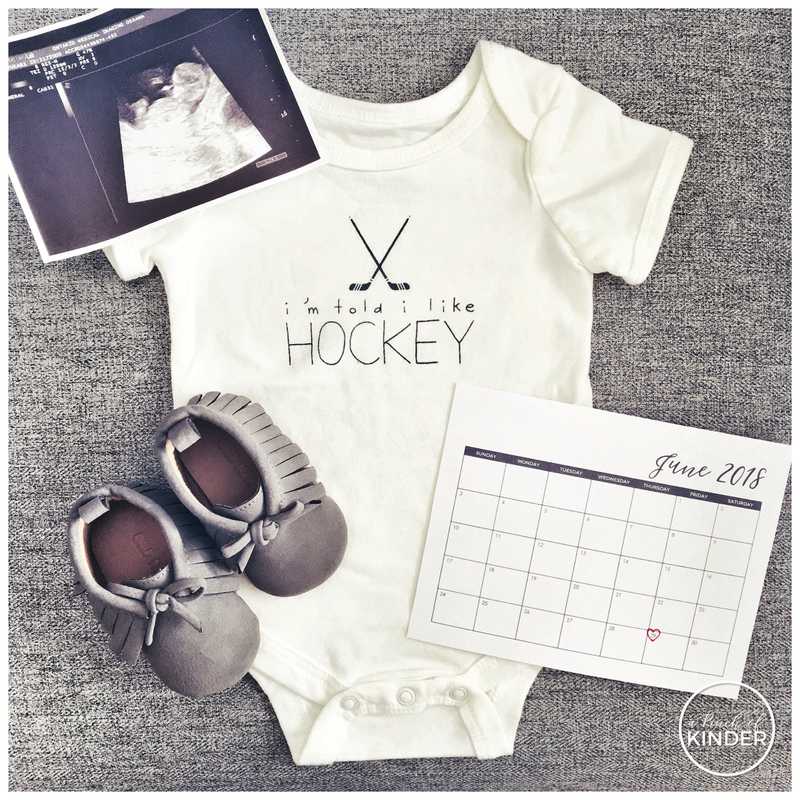 It started off a little rough at the beginning with daily morning sickness and extreme fatigue (one of the reasons why I haven't been posting as much on social media recently) but since entering the second trimester I've felt soooo much better. I'm still going to take it easy and post/share when I can. I also made some to-do lists and daily planners to plan out my winter break and get some things accomplished. I need a plan to get things done and use my time efficiently so I always make these up for every break. 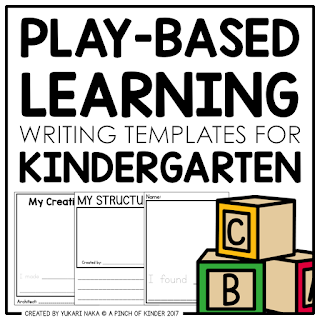 I modified them for both TPT-ers and non TPT-ers so that hopefully it will be useful to most of you who may want to use it! That's it for today! Thank you so much for following along with this little blog of mine in 2017. 2018 promises to be another busy year, but I'm hoping to continue to share my classroom with you as best as I can! Hi friends! Can you believe it's already the second week of December? 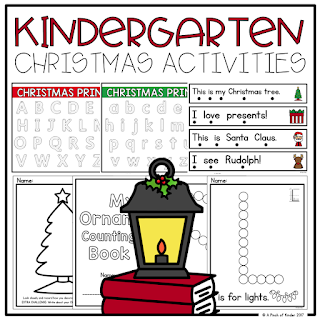 We have been enjoying lots of Christmas themed activities in our class so I thought I would share them with you today. I put I dyed 3 cups of rice (each) red and green and also added some Christmas items to the bin. Students were encouraged to explore the items and record what they found on the clipboard. Great for vocabulary and oral language development! To dye the rice I just put 3 cups of rice in a ziplock bag and added 3 tsps of vinegar and the food colouring (until I reached the colour I wanted). Just shake it up until it's evenly coated and then open the bag and let it air dry over night! Here's a picture of one of my girls drawing and labeling a candy cane she found in the bin! 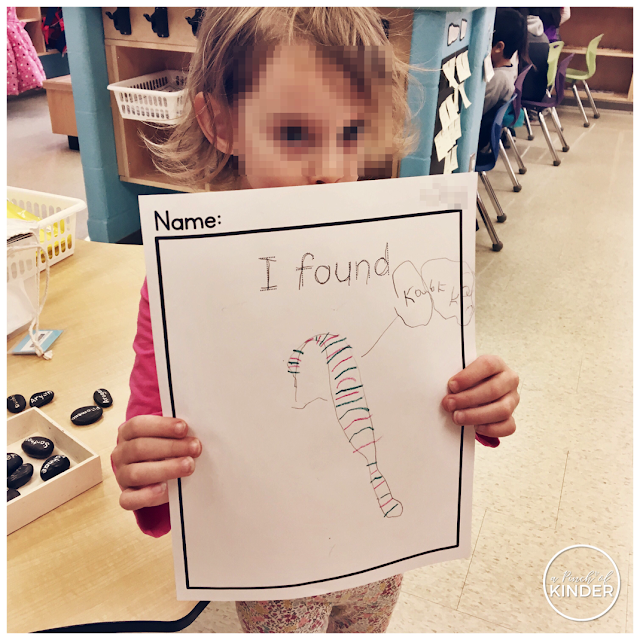 If you would like to grab the "I found" recording sheet (which can be used for any type of sensory bin) it is included in my "Play-Based Writing Templates for Kindergarten" pack. You can click here or on the image below to check it out! My kiddos were OBSESSED with do-a-dot markers when I brought them out for a patterning centre so I made up these printables with a Christmas theme. 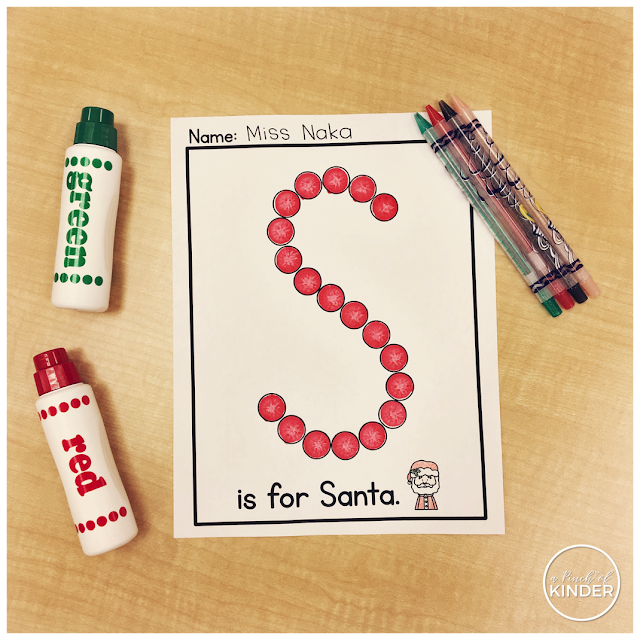 We added a new one each day this week starting with S is for Santa, L is for lights, P is for present and O is for ornament. The kids LOVED these and I think everyone went to this centre at least once, which is a rare occurrence! 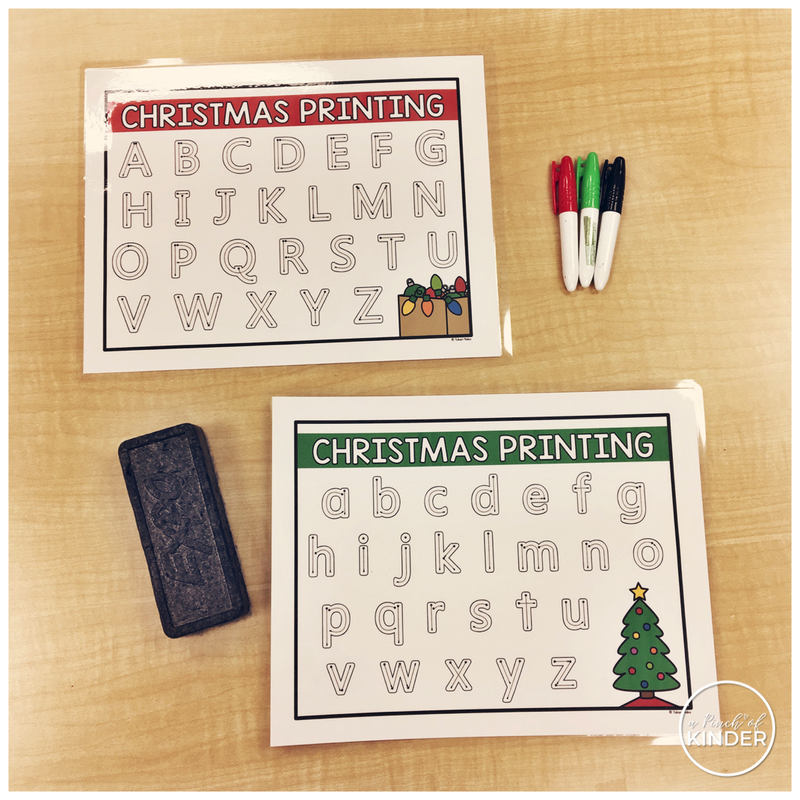 These printables are included in my Christmas activities pack on TPT. You can click here or on the image below if you are interested. 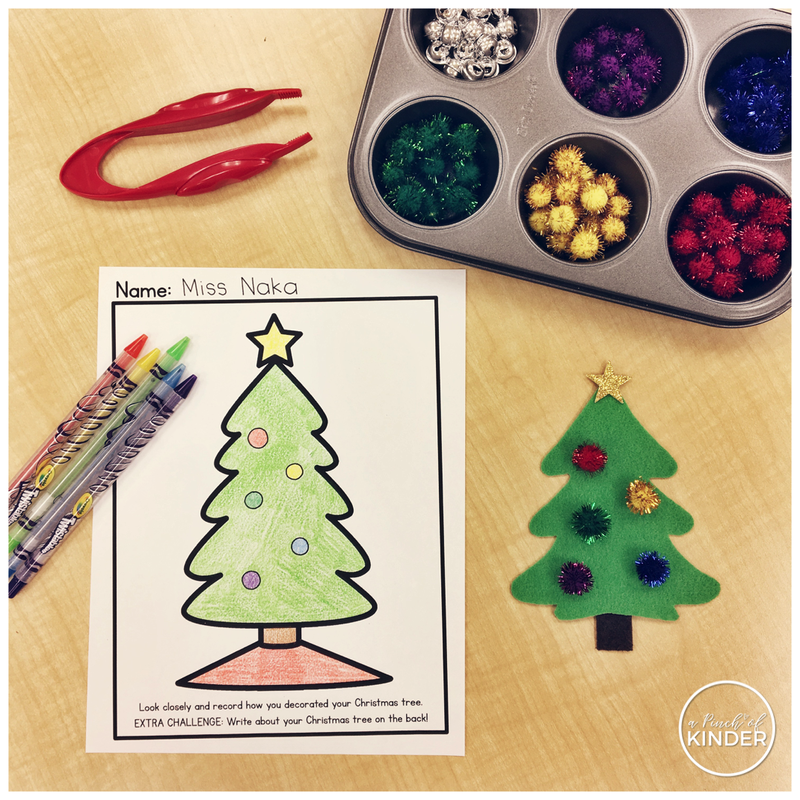 At this centre, the students were invited to decorate the Christmas tree and then draw a picture that matches how they decorated their tree! I set the felt tree out with pom poms and bells, but you could add any loose parts to this centre! 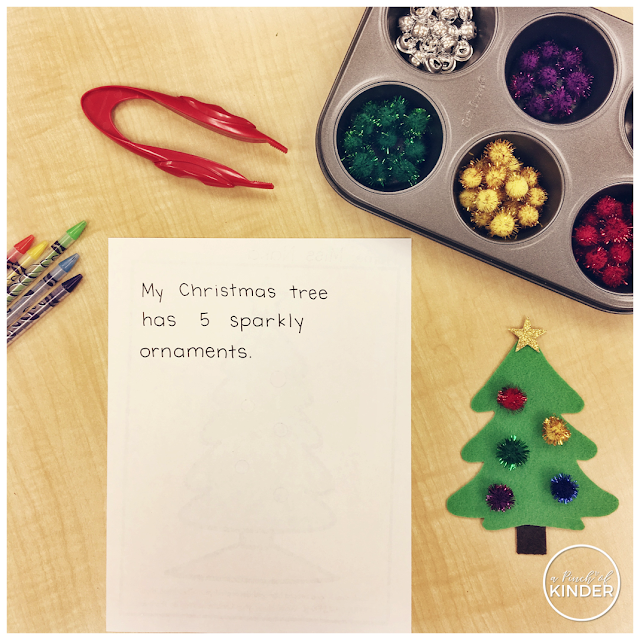 The extra challenge was to write a sentence on the back describing their tree. 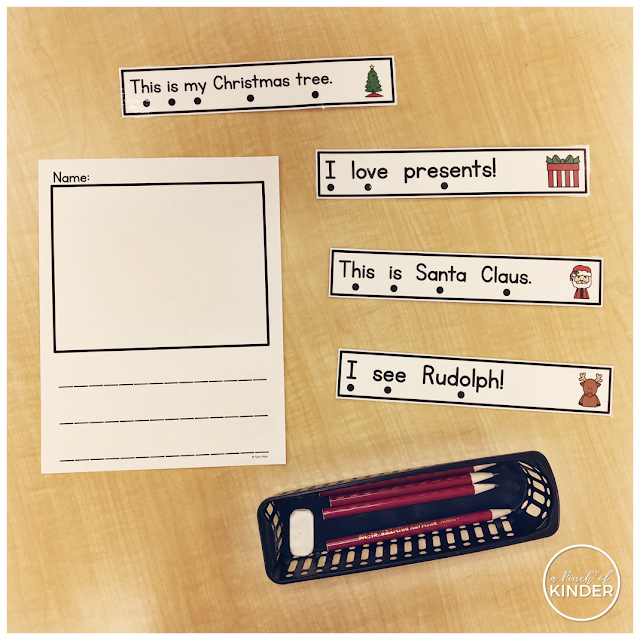 My kids did such a great job when I made these simple sentence cards for Halloween so I made some for Christmas as well! Students are encouraged to pick a card, read the sentence, write the sentence and draw a picture that matches the words. 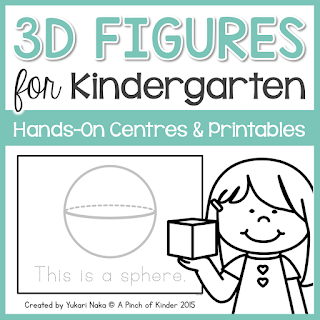 I set them out with paper and pencils some days and whiteboards on other days! I set out this example to show my higher kids that they can add more to the simple sentences and make a longer writing piece. They are getting really good at adding a second and even a third sentence to their writing pieces! This centre is always a hit and the kids loved it this year too! 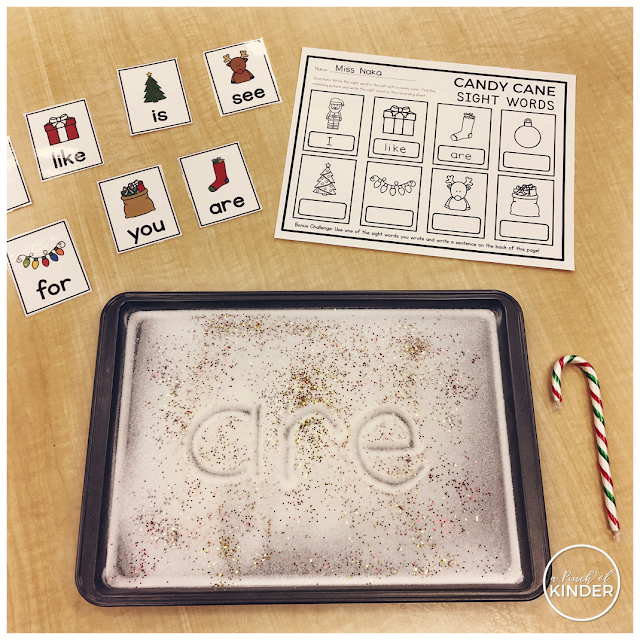 The students are prompted to pick a card, write it in the salt (I add a little bit of glitter) and record the sight word under the matching picture on the recording sheet. Letter and number formation is something that we work on with most kids for the whole year, so I made these dry erase sheets to encourage them to practice! 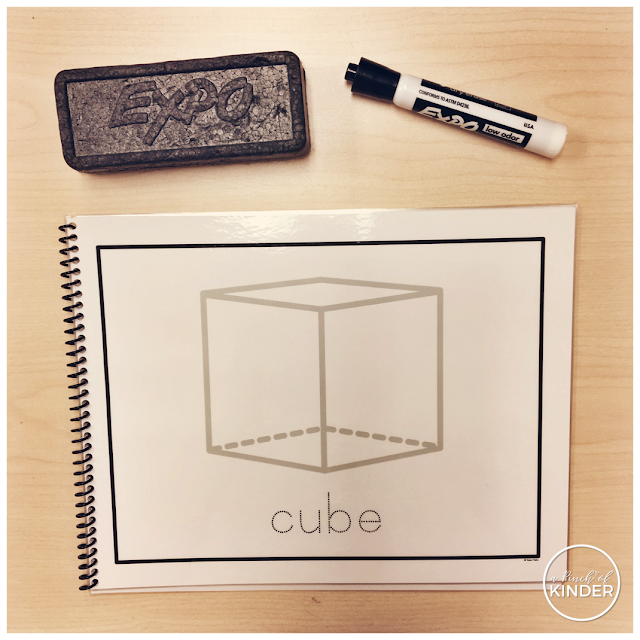 My kids love anything dry-erase so they were all over these printing sheets! 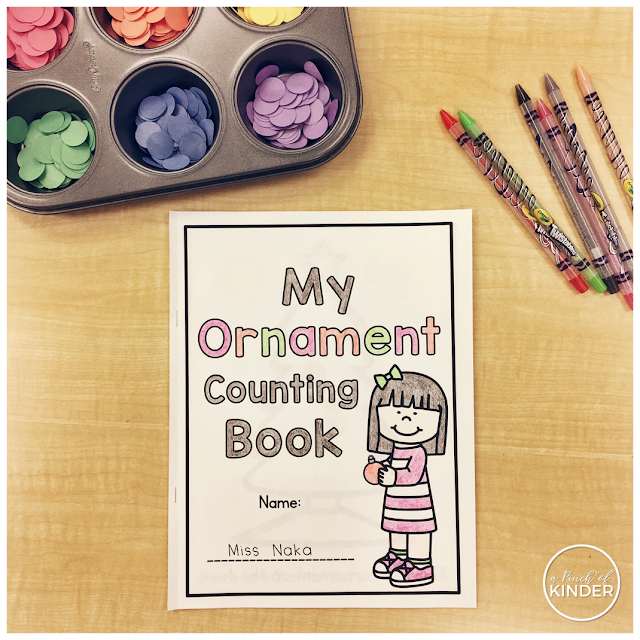 I have a group of kids who needed some guided math for creating numbers to 10 so I made up this ornament counting book! 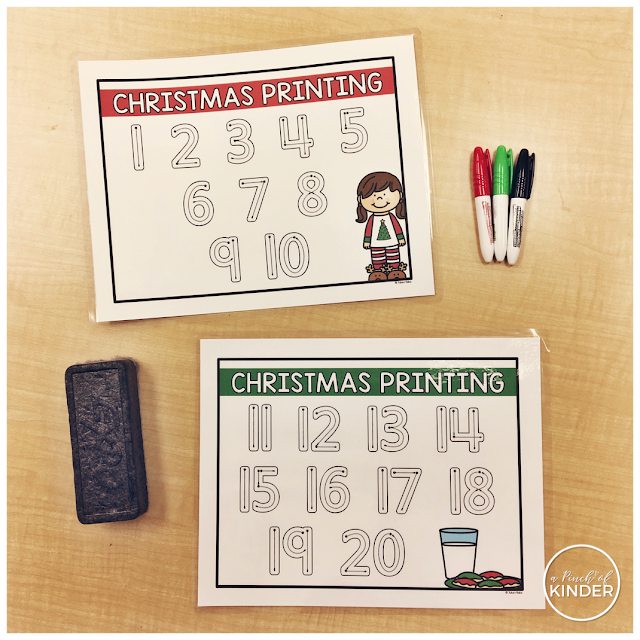 Just print and staple (I used the staple option on our photocopier so it made the prep super easy) and punch out a bunch circles out of construction paper with a circle punch (I bought mine at Michaels last year). 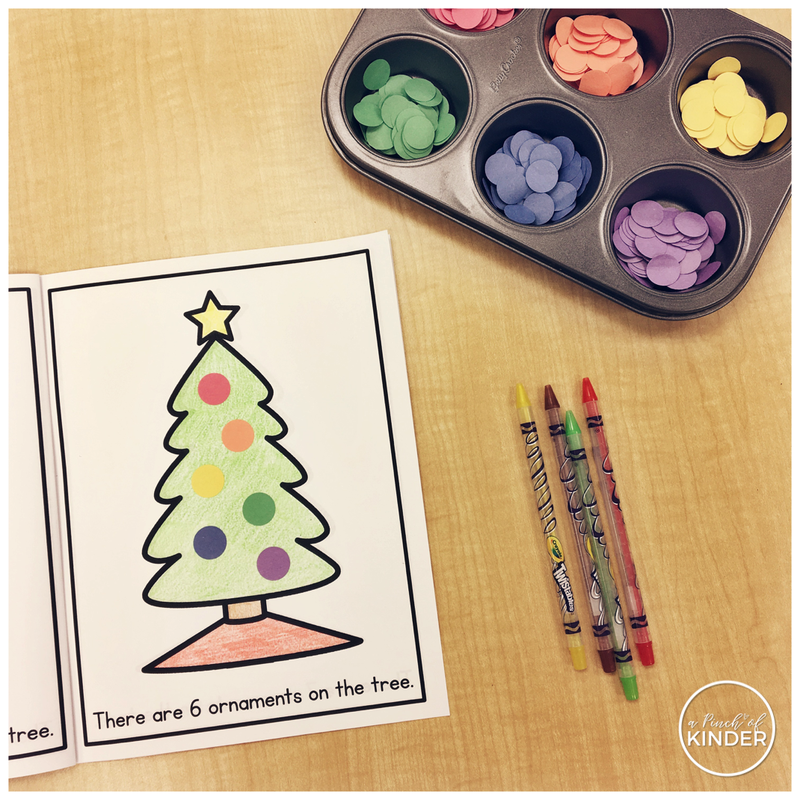 Students read the sentence and put that many circles on the tree. The numbers in this book are from 1 to 10. 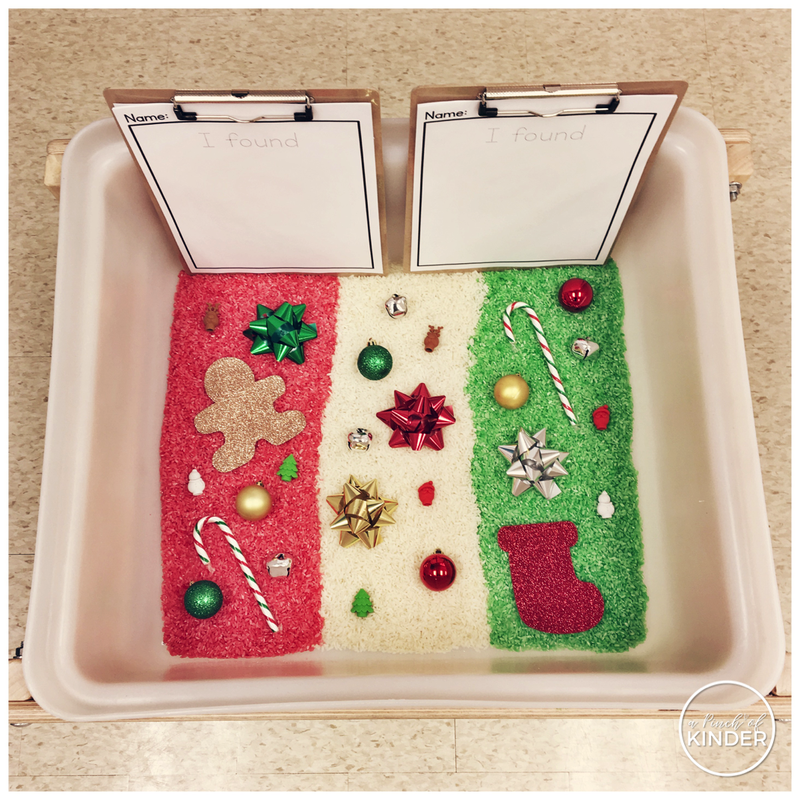 Another skill my students need practice with is ordering numbers to 10, so I made this cookie ordering centre! To make it a little more fun and tactile, I punched holes in the cards and set them out with linking chains. 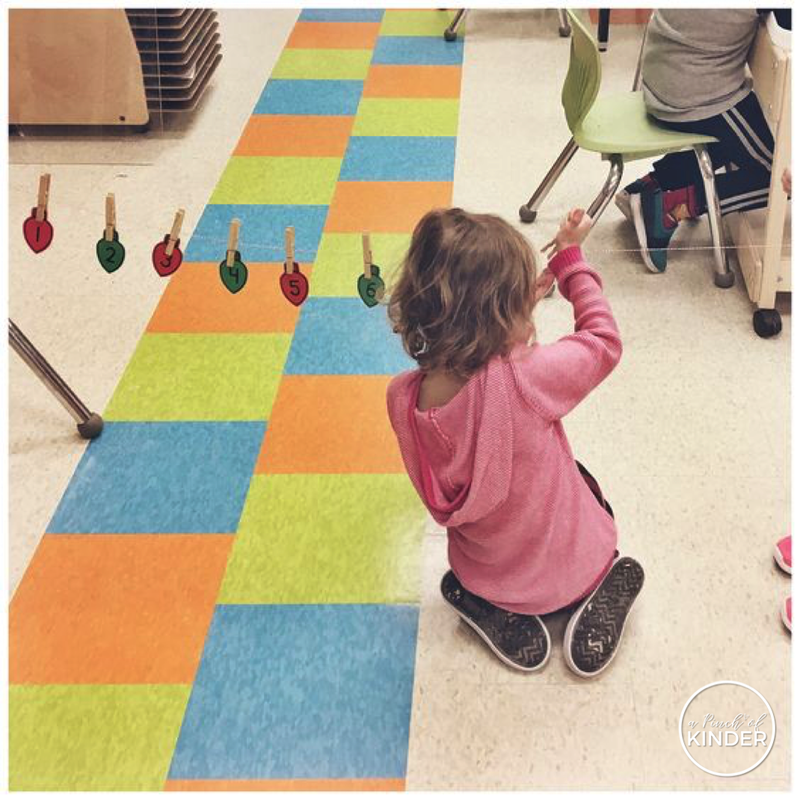 The kids love linking chains and enjoyed linking the numbers in order during math centres on Friday! We are having a door decorating contest at our Christmas concert so we finished ours up on Friday! For the tree, students were given a triangle and they were asked to decorate it however they wanted using construction paper, sticker and glitter. I love how each triangle is unique! Then we glued them together to make a Christmas tree and I added the star, trunk and snow at the bottom. I had a bunch of kids help to write out message at the top and I traced the words in sharpie, backed it on black construction paper and glued it to the top. Finally The kids got to stamp a snowflake with a snowflake cutter on blue construction paper with paint. Then we just cut the snowflakes out when the paint was dry, added their picture to the middle and taped them around the tree! 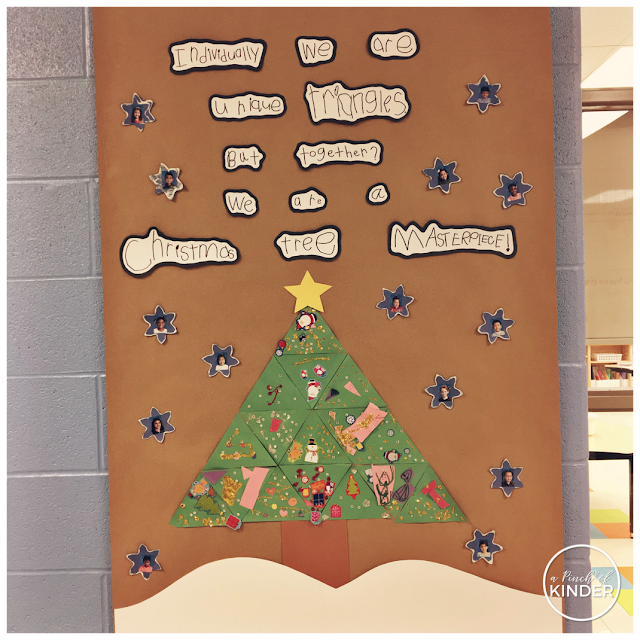 We love how it turned out and that much of what is on our door is child-created! 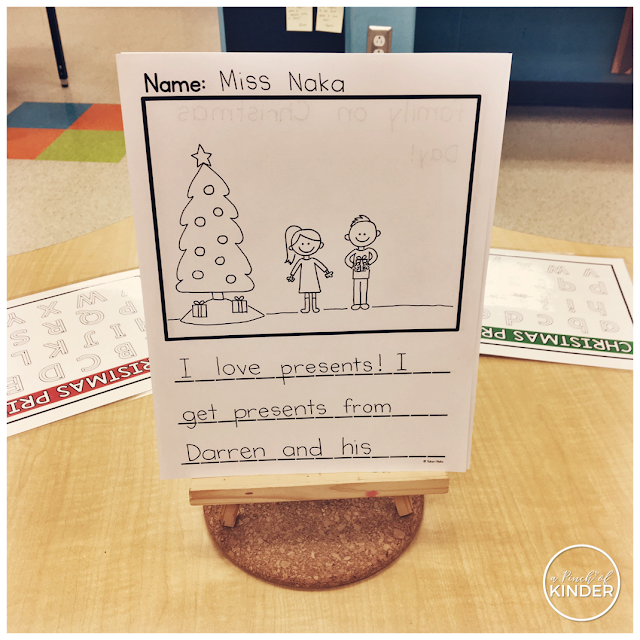 I hope you were able to grab some Christmas ideas to incorporate into your classroom!